I'm here today guest designing for Jaded Blossom. I just love everything that this company has. From their dies to their stamps, all of their products can be used in a wide variety of ways. I've recently been working with vinyl more and more and when I was creating some sport bottles for a recent fair I was at, I found this die and wanted to do something a little different from my norm. I went through the Jaded Blossom Awareness Candies and found the Think Pink saying. 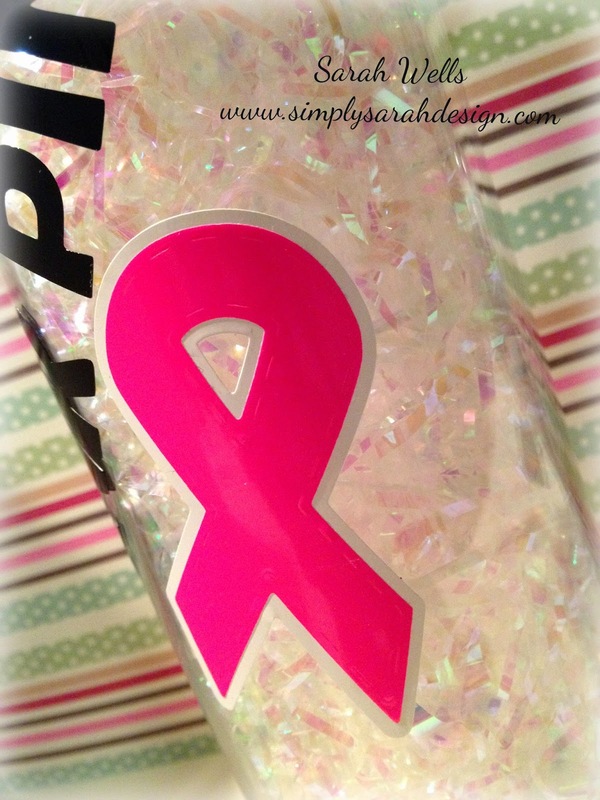 The cancer ribbon was from their Awareness Ribbon Die. My favorite part of this die is that it's stackable. The white background is the outer edge die and the hot pink is the insert. I love that this die set has stitches that imprint onto it and add an extra touch of cuteness. I'm looking forward to using more of their dies with vinyl in the future for sure! Love this and love how you thought outside the box! I agree with you so many different ways to use the products! Awesome project!!! VERY COOL Sarah!!! Love this!!! This is FABULOUS! Love the pink stacked on the white for the ribbon! Very nicely done. Looks fabulous. So neat! 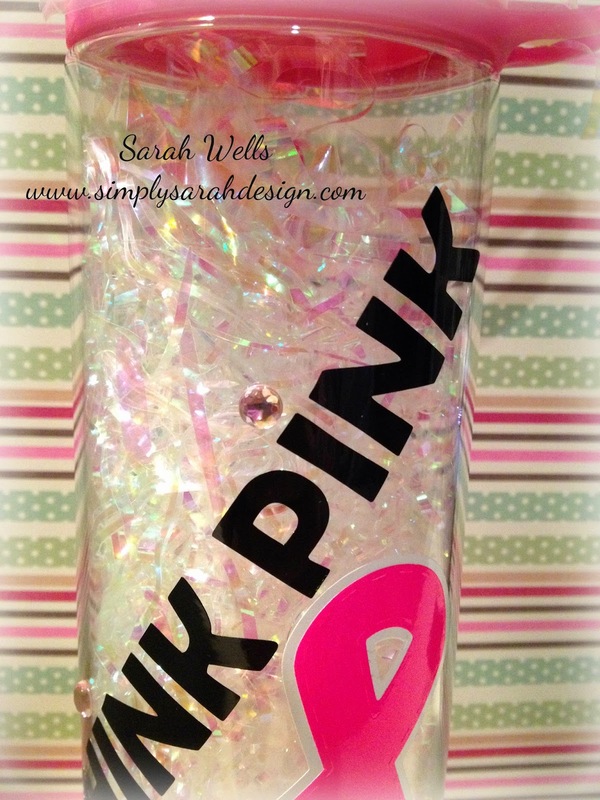 I have not tried vinyl but love the look on your water bottle. I love this! I didn't even think to try vinyl with a die. Next on my list to try for sure! Great job and looks fabulous. Waiting on my die to get here - good to know I can use it on my vinyl - now another project to do. Love this bottle...great job with layering the vinyl. I have also been playing with vinyl and have a few projects to put together yet. this is great and so useful! I haven't used the JB dies with vinyl yet, now I think i'm gonna give it a shot! So cute!! I need to try vinyl! 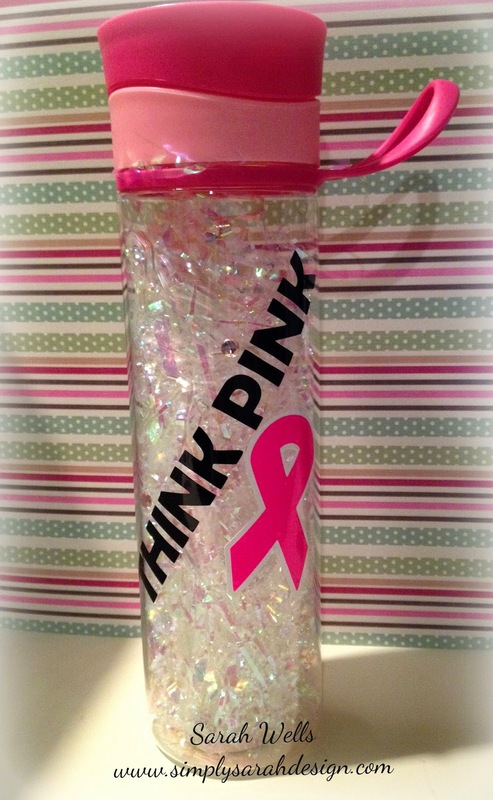 Great water bottle for a great cause. Such a wonderful and meaningful project! I haven't tried vinyl yet. I think I might !